This week at SecureIt, Ryan and Tom highlight the workbench inside of the SecureIt gun room. You’ll hear about the benefits of adding CradleGrid to your reloading bench and work area, how easy it is to install and how you can efficiently organize your storage and tools. The first thing you’ll need to do is measure the area you plan to use for your work area. When preparing for steel gun wall panels to behind your workbench, you should consider if you want the panels to align with the top of your bench or rest slightly above it. We recommend using panels that will go below the top of your bench so that you can utilize CradleGrid within all of the available space. We offer two types of heavy-duty steel panels for your gun room’s work area. The small panels are 17.25″w x 16″ h, and the large panels are 17.25″w x 36″h. So, when measuring out your workbench area or reloading station, be sure to consider those dimensions as well. You can also contact our armory and gun room build team via sales@secureittactical.com if you need assistance. When it comes to efficiency in a gun room or any firearm storage system, a key element is the method of organization! While that seems like it would be obvious, there aren’t a whole lot of storage options that provide efficient storage. SecureIt’s modular storage bins one of our most simple yet effective storage solutions that provide superior organization. Storing any gun oils, cleaning products or liquids in a small bin is a great way to prevent accidental spills from making a large mess. The mess is contained, and the bin can be easily cleaned. For gun assembly and maintenance, a medium or large bin allows you to keep track of individual parts and the disassembled gun can be conveniently stored with all associated parts and tools inside of a safe or cabinet. When you’re ready to continue working, the bin can simply be attached to the wall above your gun room’s workbench, so it is out of the way yet easy to reach. A fundamental component to any gun wall build is the gun wall mount system. SecureIt gun wall mounts can be purchased as a single set or a Trio Rifle Mount Kit that includes a tiered system. If you are working on a rifle or swapping out the lower receivers, having a gun wall mount set up above your workbench is a handy solution for gun part storage. Metal Storage Trays are a flexible storage accessory that can maximize gun wall space. 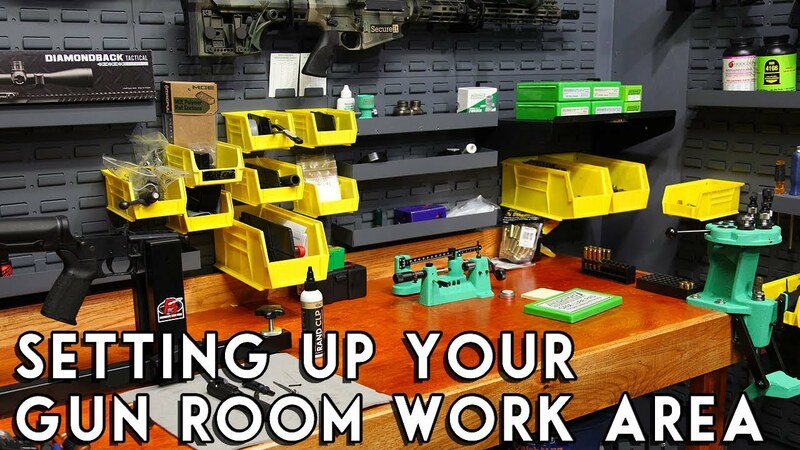 While sitting above your reloading station area, the ability to store and organize gun parts, tools, and reloading equipment creates an efficient workflow. Everything you need is within reach and organize to meet your workspace needs. Finally, by including a few Rifle and Gear Shelves within your gunsmithing area, you can conveniently store binders, books, associated boxes, and parts for anything you have in repair or are building. To see all the accessories we offer, visit our shop page today!